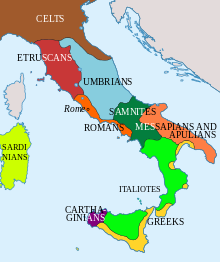 Italy in 1494, before the beginning of the Italian Wars. map from the Cambridge Modern History Atlas, 1912. The Peace of Cateau-Cambrésis was signed between Elizabeth I of England and Henry II of France on 2 April and between Henry II and Philip II of Spain on 3 April 1559, at Le Cateau-Cambrésis. Under its terms, France restored Piedmont and Savoy to the Duke of Savoy, and Corsica to the Republic of Genoa. The Papacy and Venice remained independent. 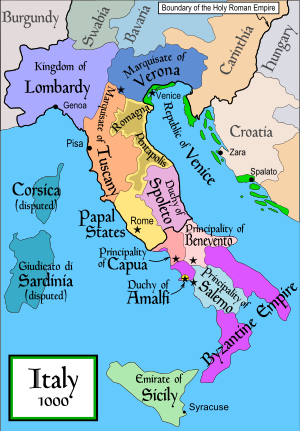 The treaty confirmed Spanish direct control of Milan, Naples, Sicily, Sardinia, and the State of Presidi. By the Treaty of Utrecht's provisions, the European empire of Spain was divided. 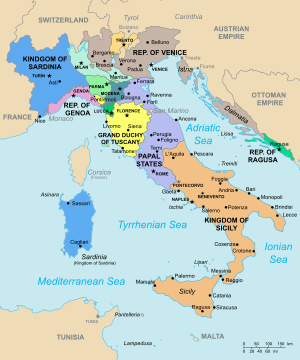 In Italy, the Duchy of Savoy received Sicily and parts of the Duchy of Milan, while Charles VI (the Archduke of Austria) received the Kingdom of Naples, Sardinia, and the bulk of the Duchy of Milan along with other minor states. Following the defeat of Napoleonic France, the Congress of Vienna (1815) was convened to redraw the European continent. In Italy, the Congress restored the pre-Napoleonic patchwork of independent governments, either directly ruled or strongly influenced by the prevailing European powers, particularly Austria. 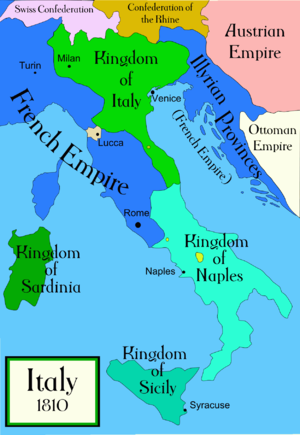 The Congress also determined the end of two millenary republics: Genoa was annexed by Sardinia, and Venice was incorporated with Milan into a new kingdom of the Austrian Empire. 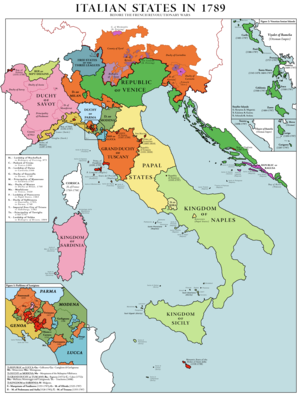 At the time, the struggle for Italian unification was perceived to be waged primarily against the Habsburgs, since they directly controlled the predominantly Italian-speaking northeastern part of present-day Italy and were, together, the most powerful force against unification. The Austrian Empire vigorously repressed nationalist sentiment growing on the Italian peninsula, as well as in the other parts of Habsburg domains.